Since I found out about the Jeep Liberty CRD I've been researching them in preparation for an eventual purchase. One aspect of the research is getting the best price on a new vehicle. The easiest and usually cheapest way to buy a new vehicle is to use one of the factory discount/employee pricing programs. When I was planning to buy a new Ford truck I joined the Experimental Aircraft Association which would have allowed me to use the Ford X-plan. This plan is about 1% under invoice vs. the actual employee discount (A plan) which is 4-5% under invoice. 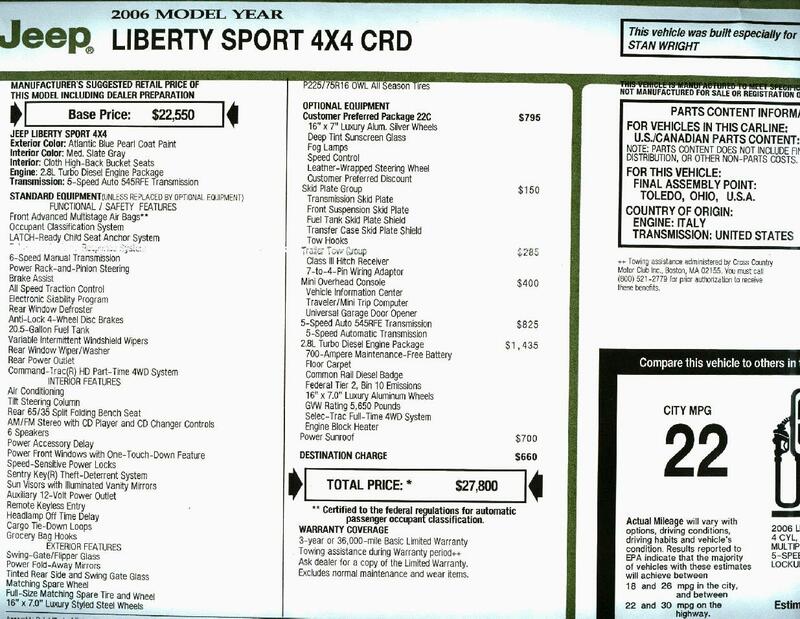 When I decided I would be buying a Jeep I looked into similar programs for Jeep/Chrysler. Their version of the Ford X-plan is called Preferred Pricing. After some research I joined the American Motorcoach Association, which allowed my to join the Freightliner's Chassis Owner's Club, which allowed me to use Preferred Pricing. During my research I eventually found a place called Jeep Warehouse.com. They have an online ordering site where you can select options and they will total a price including current incentives. Their prices were always around a $1000 below what I figured using Preferred Pricing. Their address is in Muncie, IN, which is about 150 miles from where I live. I decided when it came time to get the Jeep I'd probably get it from them. Throughout the 2005 model year I watched the internet forums to check on the CRD. Some owners reported problems with the EGR, and there were a few other common problems mentioned. One thing that disappointed me is the lack of rebates for the CRD. I wanted to buy when there was a cash rebate and a rebate for financing. I also qualify for the Jeep Everyday Heroes Reward rebate of $500. In January Jeep offered a $1500 rebate on the CRD ($2500 on gas engines), and $1000 rebate for financing through Chrysler Financial. These were the best rebates I'd seen on the CRD. 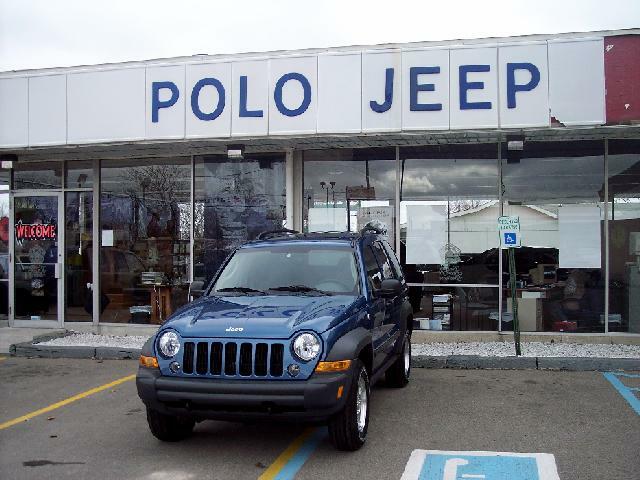 I emailed Bill Shoemaker at Jeepwarehouse to discuss the particulars of rebates. My concern was if I ordered a Jeep it would arrive when there were no rebates and the deal wouldn't be as good. Bill said you can take the rebates in effect when the vehicle is ordered or when the vehicle is delivered, whichever is better. That was good to hear. Bill said the CRDs would be built again in late February, and they hadn't built any since September, and he couldn't give me a build timeframe after February. Given this info and the good rebates in place I called him on January 16th to order the Liberty. He and I talked Jeeps for 30 minutes after placing the order. He is very knowledgable and interesting. The sticker price was $27,800. My Jeep Warehouse price (with $3000 worth of rebates and not including taxes) was $21,847. I was expecting to get the Jeep around the middle of March. I was surprised when Bill called me on February 2 and told me my Jeep was being built and I should have it within a couple weeks. On February 13th Bill sent an email letting me know my Jeep was ready to pick up. I told him I'd be up on Friday (my next day off). My girlfriend and I left the house at 8 am enroute to Muncie. Polo Jeep was easy to find and we arrived a few minutes before 11. There were Jeeps everywhere...all around the building...in the back lot...even across the road. I saw my Jeep sitting outside waiting for me (above picture). We went inside and met Bill. He directed us to the office where the financial paperwork was taken care of. Afterwards Bill spent the better part of an hour going over the owner's manual, maintenance schedule, etc., and showed us all the features of the Jeep. He sent us off with a $15 coupon for diesel at the local Marathon. We stopped at the Olive Garden and ate more then we should've. The Liberty drove like a dream all the way home. It has plenty of gitty-up, and good fuel mileage to boot! If you plan to buy a Jeep give Bill at Jeepwarehouse a call. You can pick it up there or they can ship it to any dealer in the country.